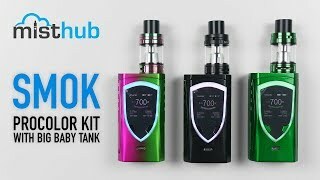 SMOK astounds the market once again with the unprecedented SMOK ProColor 225W TC Kit with TFV8 Big Baby Tank. The remarkably well-designed ProColor 225W TC Mod has a weight of 151g, a height of 85mm, a width of 46mm and a diameter of 29.5mm that suits two high-drain 18650 batteries (batteries not included) through a hinged battery cover. The ProColor’s frame has an anti-slip design that gives it a firm and comfortable grip even during extended sessions from virtually limitless hand held positions. This mod includes numerous unique and user-friendly features, including a large 1.3” OLED screen that stands out with a customizable RGB backlight that’s trim shaped and can be setup to display twelve eye-catching colors. Along its exterior are three keys—a long, lateral firing bar on the side of the device that stretches from the top of the mod to the bottom of the mod, and two ultra-responsive regulatory buttons that’ll enable you to easily navigate through the mod’s menus, as well as alter the current wattage and temperature. Offering both Variable Wattage and Temperature Control, this mod offers a large spectrum of adjustable settings, including an operational wattage range that can be fired as low as 6W or cranked up to 225W, an output voltage that reaches 9V, a minimum resistance of 0.06 ohms, and a temperature range that spans between 200 and 600 degrees. The ProColor 225W Mod has intelligent atomizer recognition, a puff monitoring system, over-heating protection, low-battery warning, and a twelve second cut-off that’ll drastically help conserve battery life. The ProColor also remembers your favorite settings so you don’t have to adjust them each time you’re ready for your next session. The SMOK ProColor 225W Kit is compatible with Ni200 Nickel and Titanium wires for all of your Temperature Control vaping needs, and can be used with Stainless Steel heating elements in both TC mode and Variable Wattage mode. This 510 threaded device ships ready to be vaped with any of your favorite 510 sub-ohm tanks and ships with SMOK’s heavy hitting TFV8 Big Baby Tank. 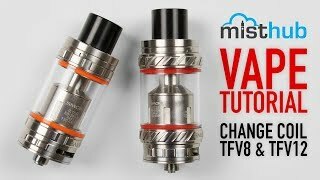 The SMOK TFV8 Big Baby Beast Tank has perfectly suitable dimensions for the ProColor 225W Mod. Made of superior Stainless Steel construction and high grade Pyrex Glass, the Big Baby Tank has a 56mm height, 24.5mm diameter and a weight of 60g. Sticking to their tried-and-true top-filling system, SMOK has continued to implement their top-fill swivel cap design. This user-friendly feature enables you to fill the tank by rotating the top cap counter-clockwise, with no need to remove the wide bore Delrin drip tip. Included with the Big Baby tank is the flavor-driven 0.4 ohm V8-Baby Q2 Dual Coil Head (rated at 30-80W) and the 0.15 ohm V8-Baby T8 Octuple Coil Head (rated at 50-100W). Both of these atomizer heads are wicked with Pure Organic Cotton to bring out SMOK’s trademark bold and rich flavor, and feature SMOK’s patented Baby Turbo Engine coil structure. Time spent filling the Big Baby Beast will come few and far between, thanks to the massive 5mL E-Juice reservoir that’s more than capable of making it throughout the day on just a single fill. 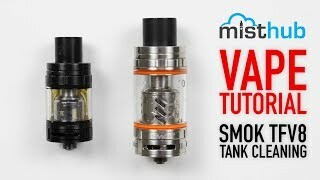 Between the elongated wide bore drip tip and the dual adjustable airflow slots at the bottom, this vape tank makes way for some intense cloud production that exceeds other tanks that are of similar size and stature. Altogether in a single innovative kit, the remarkable TFV8 Baby Beast Sub-Ohm Tank and ProColor 225W TC Mod stand out amongst the crowd, and will be quite unlike anything you’ve ever seen or experienced in the vape community!